New Holland’s B Series backhoe loader is an excavator and a wheel loader rolled into one. 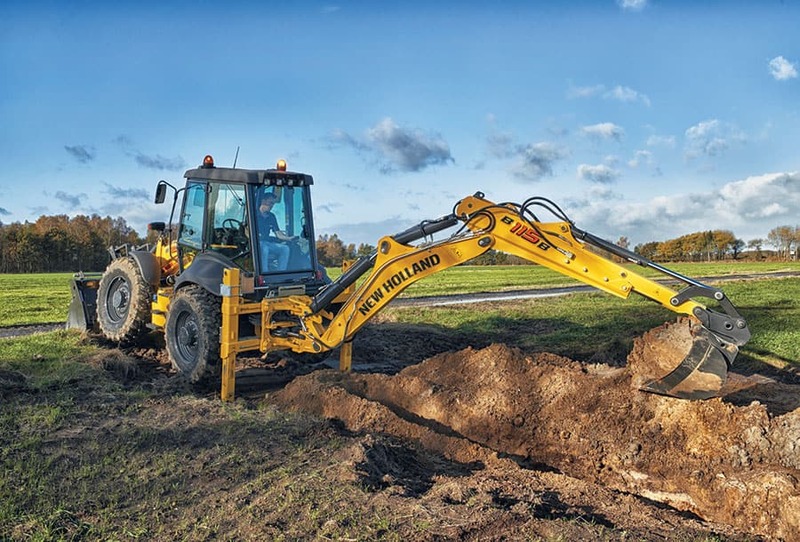 Particularly useful on farms and busy livestock units as well in any construction site: performance and ability to do a multitude of different tasks, no other machine is “multi-purpose” like the B Series. B90B is equipped with Straight Loader Arm: an effective design which provides higher visibility on the front of the machine, higher lift capacity and greater lift height. The anti-tipping function keeps the bucket on the correct position while lifting the load, so there is no risk of material spillage. 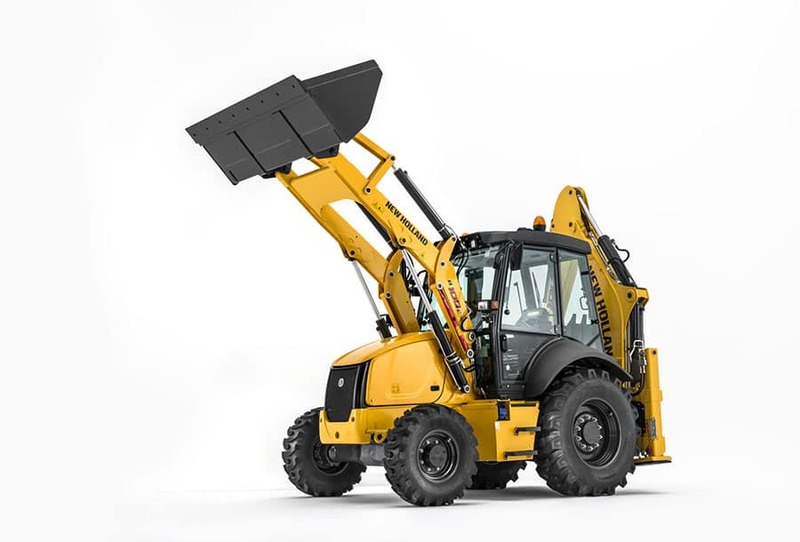 B115B has the Tool Carrier loader arm suitable for intensive truck loading, with greater reach and returnto- dig function significantly it reduces the operator effort on repetitive loading operations speeding up the whole cycle. Excellent front loader visibility and the mechanical self-levelling feature make loading and unloading pallets really quick and simple. 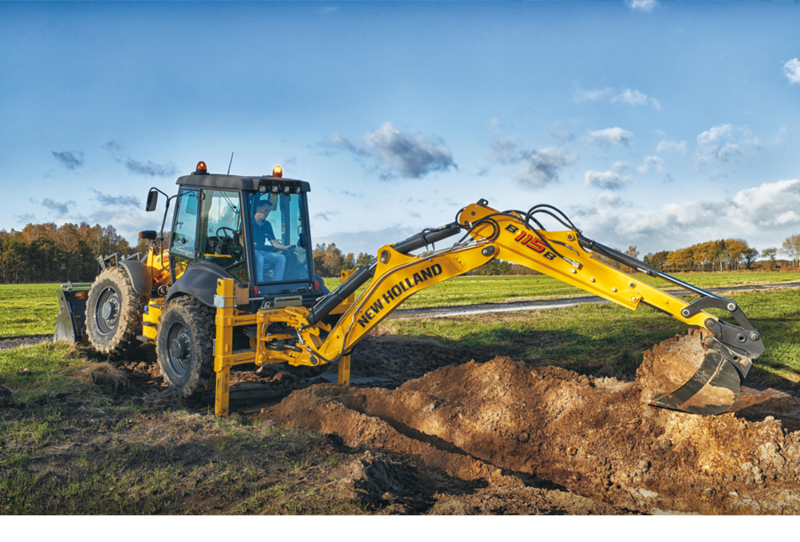 New Holland offers its backhoe loaders with four wheel drive. The Powershuttle mechanical transmission on B90B features a gear lever incorporating de-clutch button and a shuttle lever on steering column. It is the ideal choice where the backhoe will see more use than front loader. The automatic four-speed Powershift transmission of B115B includes a steering column mounted lever for both shuttle and gear selection, loader joystick carries on the de-clutch button. It is the right transmission choice for extensive front loader duties. The all-wheel steer B115 C has equal size front and rear wheels with selectable front, all-wheel and crab steer modes. Climb aboard the cab of the B Series backhoe loaders and you find a comfortable, well-appointed operator environment with low noise levels of just 77dB(A). Powerful heating and, optional, air conditioning ensure operator comfort throughout the day. All the controls for the front loader are positioned on a single, right hand joystick; 4-in-1 or 6-in-1 bucket opening is also activated by roller from the lever. The fully adjustable seat can be turned through 180 degrees to reposition for use with the backhoe. Two floor mounted conventional levers or joysticks, mounted on fully adjustable towers, provide good feedback and response from the backhoe hydraulics. The B Series range of backhoe loaders are powered by Tier 3 4.5L NEF engines developed in partnership with FPT Industrial. The B90B engine has a robust mechanical injection system, while the B115B engine is equipped with high pressure common rail injection to provide high power and torque for top loading performance. A key factor to grant equipment performance and longevity is routine care. 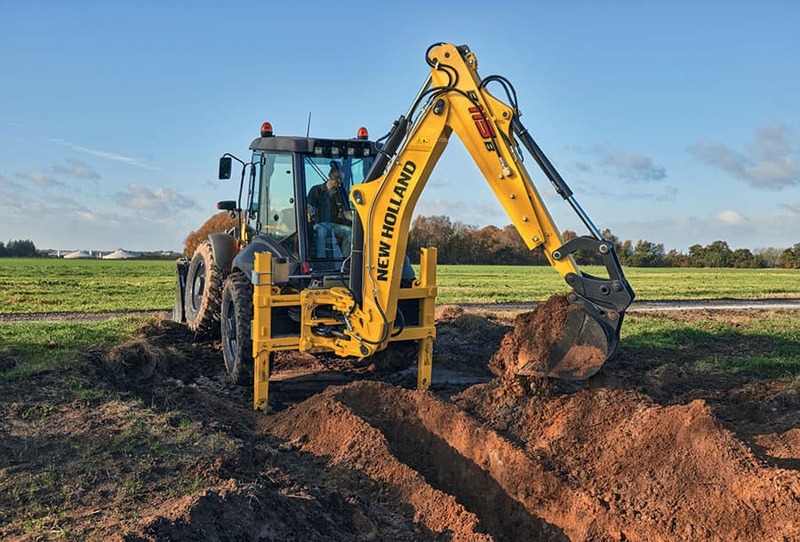 New Holland has designed the backhoe loader so it takes the minimum of time to carry out routine checks: one piece hood for full engine access and all key daily checks grouped together.